A Chinese icebreaker that helped rescue 52 passengers from a Russian ship stranded in Antarctic ice found itself stuck in heavy ice on Friday, further complicating the 9-day "roller-coaster" rescue operation. 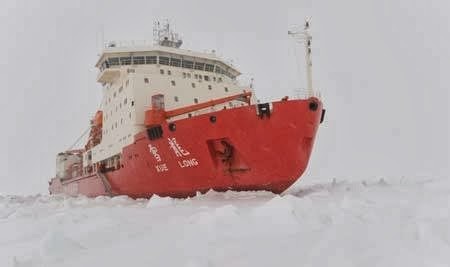 The Snow Dragon had ferried the passengers from the stranded Russian ship to an Australian icebreaker late on Thursday. It now had concerns about its own ability to move through heavy ice, the Australian Maritime Safety Authority (AMSA) said. "It will attempt to maneuver through the ice when tidal conditions are most suitable during the early hours of 4 January 2014," AMSA said. The Australian icebreaker carrying the rescued passengers, the Aurora Australis, will remain on standby in open water in the area "as a precautionary measure", the rescue agency said. The Aurora Australis had meant to sail towards an Antarctic base to complete a resupply before carrying the rescued passengers back to Australia. A helicopter from the Snow Dragon carried the 52 scientists and tourists in small groups from the ice-bound Akademik Shokalskiy to the Australian supply ship late on Thursday. The rescue, delayed due to weather and ice conditions, took around five hours to complete. It had been a "roller-coaster" rescue, said Greg Mortimer, one of three expedition leaders on the Akademik Shokalskiy. "I was immensely relieved for the people under my care," Mortimer, quoted by the Age newspaper, said after arriving on the Aurora Australis. He said he was "very sad" to leave behind the Russian vessel and its crew. "The passengers seem very glad to now be with us and they are settling in to their new accommodation," Jason Mundy, Australian Antarctic Division Acting Director, who is on board the Aurora Australis, said on Friday morning. Mundy said there were enough rooms for the passengers, and the ship can "look after them well for the final part of their journey". Passengers, mostly Australians and New Zealanders, will probably arrive in Australia's southern island state of Tasmania around mid-January. The Akademik Shokalskiy's Russian crew will stay on board until the ice breaks up and the ship is freed. The Russian-owned research ship left New Zealand on November 28 to commemorate the 100th anniversary of an Antarctic journey led by Australian explorer Douglas Mawson. It became trapped on December 24, 100 nautical miles east of French Antarctic station Dumont d'Urville and about 1,500 nautical miles south of Tasmania. During their time on the ice, passengers amused themselves with movies, classes in knot tying, languages, yoga and photography, and rang in the New Year with dinner, drinks and a song composed about their adventure. The Chinese icebreaker got within sight of the Akademik Shokalskiy on Saturday, but turned back after failing to break through the ice, more than 3 meters (10 feet) thick in some places. The Aurora Australis and a French flagged ship tried to help, but failed to reach the ship because of strong winds and heavy snow.